When John Duggan installed the much-anticipated first Service Pack (SP) for Windows Vista on his laptop, he had no idea what a long ride he was in for. "It felt like it took forever," says the frustrated account manager from New Jersey. Duggan's frustration is shared by many others, most of whom would have welcomed the experience of having the installation taking forever. Many got an endless parade of blue screens, system restart loops and missing drivers. SP1 is one hefty package. The 32-bit version weighs in at 434.5MB. The 64-bit version is a whopping 726.5MB. This first update for Microsoft's latest and beleaguered operating system promises to address key feedback from customers -- in five languages, no less. The first install screen (see Figure 1) might just break your spirit right off the bat. It says, "The installation might take an hour or more. Your computer will restart several times during installation." That raised an eyebrow, and brought up several questions. I can install Vista in less than an hour. Why will this update take me so long? Why is it so large? Figure 1. Once you fire up SP1 for installation, a foreboding message warns you how long the process will take. 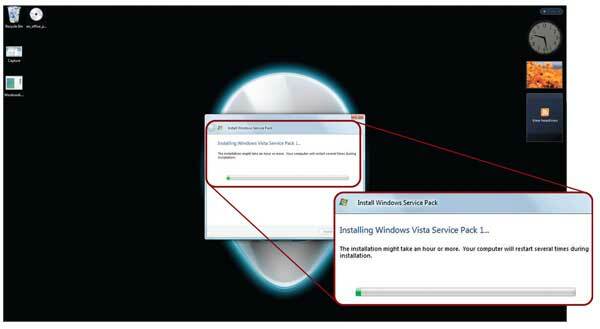 This is what many Vista users who have already installed SP1 have also pondered. Clearly, there are concerns that SP1 is not worth the trouble. Is that the case, or do the enhancement ends justify the frustrating installation means? When I first downloaded Vista SP1, it seemed as if all the rumors were true. I could hear the voices of angry beta testers echoing in my mind, saying: "Don't do it." While not a panacea for all the complaints about Vista, SP1 certainly addresses most of the major concerns the user community has raised. Performance and reliability are two of the biggest issues SP1 addresses, and it does so fairly well. Overall, I believe it delivers on stabilizing Vista, and makes it more "enterprise-worthy" and ready to deploy for those organizations that invariably wait for that first Service Pack, despite the wait you may experience when you install SP1. As is usually the case, there's more than one way to deploy SP1 to Vista desktops. The "easiest" way -- according to Microsoft -- is to let Windows Update automatically download and install SP1. In this case, Windows Update will only download and apply the files your system needs. This lightens the bandwidth load, especially when compared to the full download. Oddly enough, if you go with Windows Update, you'll come across a strange situation. Although Microsoft has released SP1-and it is widely available-the update Web site says, "It could take a month before SP1 shows up on your PC, so please be patient." Upon checking Windows Update on my personal system, it informed me it had one important update to install. It must have been important. It said it would be anywhere from 65MB to 427MB. To give the deployment process a thorough test-drive, I decided to go both "new school" and "old school." I took one system and went with Windows Update. For the other system, I pulled the file down the old-fashioned way through the Microsoft Download Center. That definitely gave my broadband connection a workout. This is a valid way to deploy SP1 on a network that's running Systems Management Server, Windows Server Update Services (WSUS) server, System Center Essentials or System Center Configuration Manager 2007. Both deployment methods took about the same amount of time and both worked just fine. I didn't encounter any blue screens or anything else that stalled the process. That's not to say that others aren't having their share of issues with SP1. You know it must have caused quite a stir because Microsoft is offering free support to SP1 users. Brandon LeBlanc, a manager at Microsoft, announced "free support to anyone who is having issues installing Windows Vista SP1." The SP1 support site provides e-mail, online chat and telephone support. You can get "unlimited installation and compatibility support [at] no charge until March 18, 2009," according to the Microsoft Web site. There's yet another method called "integrated installation." This puts SP1 right onto the newest Vista installation DVDs. The deployment guide called this a "slipstream installation" that will install the operating system and SP1 simultaneously. It's impossible to uninstall the Service Pack if you use this method. There's another caveat to those with existing deployable WIM images they plan to use for deployments. You can't slipstream SP1 directly into your deployment image. The reason for this is that the servicing layer in Vista, which also allows updates to occur smoothly, is being updated as well. So you'll have to install the new ISO or DVD to a system, perform your customization and re-capture the image. Another thing worth noting is that if you've been working with the Windows Automated Installation Kit (WAIK), you're going to want to pick up the latest version that supports SP1 and Server 2008. Many have said-or blogged or twittered, to use the current vernacular -- that SP1 is nothing more than hot-fix rollups and function updates. That is indeed true. SP1 includes all the fixes Microsoft has come up with since Vista was released to manufacturing (RTM). It's actually quite helpful to have one-stop-shopping for fixes. Many administrators wait for a Service Pack so they can update en masse, rather than work with Windows Update, WSUS or a third-party update tool. Microsoft also made it quite clear that SP1 isn't intended to deliver substantial new features, but rather to improve existing features that have a negative impact on customers. For a list of all the hotfixes and security updates included in Vista SP1, click here. Most of the enhancements won't even be visible to users. They should, however, notice improved performance. But that's not always something you can put your finger on and say, "See that? That happened a few seconds faster with SP1." Local file copying on the same disk is improved by 25 percent, copying files from a remote non-SP1 system to your SP1 system is improved by 45 percent, and from an SP1 system to your SP1 system is improved by 50 percent. The progress estimation window will appear faster-within two seconds. The time to start the Event Viewer is now reduced by 75 percent. Battery life is improved by reducing CPU load and screen redrawing. Vista's speed, or more accurately its lack thereof, has been a common complaint since its release. Therefore, any performance improvements will be welcomed. Of course, one of the biggest performance problems we've seen these days comes from insufficient memory in systems running Vista. While the minimum requirement doesn't call for 2GB or higher, Vista is a memory hog and memory is cheap these days. The cost is slight when compared to the benefits. For those of you struggling to handle Vista on your machines, SP1 won't be a panacea. Benchmark tests have varied -- depending on the personal agenda and relative skill level of those conducting the benchmark -- but Vista clearly won't perform as well as XP on comparable hardware. On the other hand, why should it be noticeably faster? You're running a new, more powerful OS that naturally requires more powerful hardware. BitLocker can now encrypt more than just the C: drive. You can add a PIN to a USB key if you use this method of storing your encryption key. If you use a Trusted Platform Module (TPM) chip, you can add an additional key and store it on a USB drive with a PIN. There are some IPv6 changes that correct a problem with IPSec and Network Discovery. There's additional support for stronger cryptographic algorithms used in IPSec, such as Secure Hash Algorithm (SHA)-256, Advanced Encryption Standard-Galois/ Counter Mode (AES-GCM) and AES-Galois Message Authentication Code (AES-GMAC) for Encapsulating Security Payload (ESP). It also supports Authentication Header (AH), Elliptic Curve Digital Signature Algorithm (ECDSA), SHA-384 for Internet Key Exchange (IKE) and Authenticated Internet Protocol (AuthIP). The Network Access Protection (NAP) is updated to work better with Windows Server 2008 so it can find Health Registration Authority (HRA) servers through DNS SRV records. You can now run the Key Management Service (KMS) within a virtual machine. There are some changes to the way Vista works with Terminal Services. SP1 addresses the problem with printing to local printers from a 2008 Terminal Services session. Security is also improved, as .RDP files can now be signed. There are some less obvious, but still useful changes with SP1 that you may or may not even notice without having them pointed out. For example, you can now easily control the volumes on which you want to run Disk Defragmenter -- though, in truth, you could perform this from the command line prior to SP1. Donna Tardugno, a wedding videographer in New York, recently purchased a laptop with 4GB of RAM. She was shocked to see only 3GB showing up in the System properties. She wasn't the only one frustrated by "missing" RAM. Apparently, this is a limitation in the way the 32-bit version of Vista handles memory (the 64-bit version doesn't have this issue). It's no longer an issue, as SP1 fixes the problem and shows you the full amount of memory in your system. To better work with emerging hardware standards, there's a new file system called the Extended File Allocation Table (exFAT). This is similar to FAT32, but it supports file sizes larger than 4GB and can partition and format volumes larger than 32GB. There are also unique icons for Blu-Ray and HD-DVD drives, though that doesn't seem to be much of an issue as Blu-Ray is now taking over the DVD market. If you're a Group Policy admin, you'll be surprised -- if not shocked -- to find that Microsoft has removed the Group Policy Management Console (GPMC) from SP1. That may seem odd, but it's actually a good thing. You'll need to download Microsoft Remote Server Administration Tools, which is an updated version of the GPMC. Microsoft changed tools because they needed Group Policy to work better with the recently released Windows Server 2008. This may not matter as much to you, but there are updates on the entertainment side of Vista, as well. There are changes to the Windows Media Center, like new extender support for digital television and networked DVD players. There's also an enhancement for the MPEG-2 decoder that permits greater content protection and lets Vista broadcast that content out over networks. Direct 3D gets an update to 10.1 to enhance video game support for new hardware. There's also support for network projectors to support "custom projector" or non-standard resolutions. There's actually a lot more to SP1. We presented the larger, more interesting changes here, but you can drill down to the smallest detail by checking out the Vista TechCenter here. If you install SP1 and all goes smoothly and you have no issues, no blue screens and no infinite loops -- as many are reporting -- consider yourself lucky. The features described here and the myriad of changes that come with SP1 are certainly worthwhile. That being said, there have been many complaints along the way. Blue screens, missing drivers, installation hassles and the like are causing many to question their decision to go for SP1. Who's to say if it's worth it or not? You are -- let us know what you think of SP1.